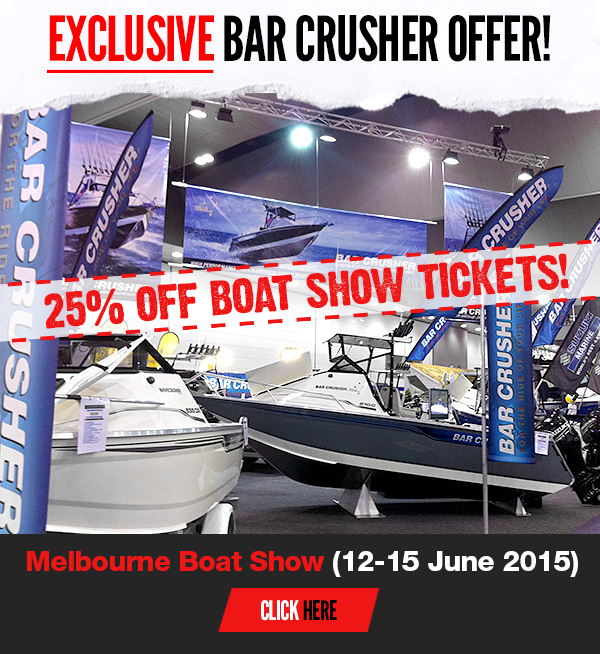 Bar Crusher’s boat show discount! Looking for a new Bar Crusher? There’s no better place to check out a range of models in one place than at the Melbourne Boat Show (12-15 June 2015). We’d like to see you there, so we’re offering you a 25% discount on the price of boat show tickets! Simply visit www.melbourneinternationalboatshow.com.au, enter the promo code BARCRUSHER and select the tickets you want to buy. Speak with us at the show about the special pricing on our new 490C and 490WR or about customising your dream offshore Fishing Weapon – be that Australia’s Greatest Boat the 670HT, or our flagship 780HTP. Of course, we’ll also have a few of our hugely popular C series boats on display. The folding roof/windscreen reduces the boat’s on-trailer height by around a metre for easy storage under carports and low garages. We look forward to seeing you at the boat show!